A sequel entered production in the same month that the first film opened in Japanese theatres. 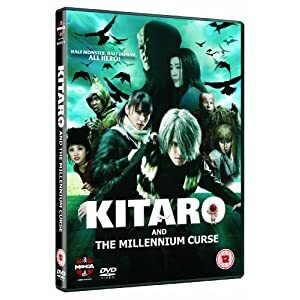 With an appreciably higher budget and a few stylistic tweaks to make it closer to the original manga, Kitaro and the Millennium Curse was filmed between December 2007 and March 2008. Unlike the previous movie, it featured an all-new plot unrelated to any anime or manga incarnations, with the story of a cursed song that brings death to anyone that hears it. When Kaede Hiramoto (played by a new teen idol, Kii Kitano) hears the Song of Kagome, she has 48 hours to live unless Kitaro can somehow perform a ritual of exorcism. To break the spell, he must find five magical musical instruments, and use them to perform a counter-spell before time runs out. But as he searches desperately for the necessary pieces of the puzzle, he runs into interference from the scheming old spirit Nurari, who has an altogether more apocalyptic plan that will affect the whole human race. Kitaro first appeared in 1933, as the leading character in Kitaro of the Graveyard (Hakaba no Kitaro), a kamishibai franchise. Kamishibai, literally, ‘paper theatre’ was a low-tech forerunner of television, not unlike a cross between Punch & Judy and a magic lantern show. A wandering storyteller would arrive in a new spot, sell sweets to the local children, and then entertain them by narrating a short story while displaying a series of hand-drawn images in a TV-shaped frame mounted on the back of his bicycle. These storytellers, or benshi, often doubled as the narrators for early black-and-white movies at cinemas, and the nature of their performances is one of the lost arts of the 20th century. Kamishibai all but died out in the 1950s with the advent of television, but the young Shigeru Mizuki (b.1922, as Shigeru Mura) was enchanted by paper-theatre tales of the skull-faced super-hero Golden Bat and the abandoned ghost-boy Kitaro of the Graveyard. An odd, bookish child obsessed with death from an early age, Mizuki also relished the many Japanese ghost stories recounted to him by an old woman who had been born at the tail end of the samurai era. Fired from his first job at a printers for his slow rate of work, he went back to school to study art in Osaka. Drafted into the army in 1942, he was posted to Papua New Guinea, where his unit was decimated by disease and enemy attacks. Mizuki himself lost his left arm in a bombing raid. He originally intended to remain in Papua New Guinea (where today there is a street named after him), but was browbeaten by a military doctor into informing his parents in person. On his return home, he found that his brother had been convicted as a war criminal, and that now he was back on Japanese soil, he was subject to the emigration restrictions of the Occupation and unable to leave again. Instead, he found himself working as a projectionist in a cinema. He also became an artist for the last surviving kamishibai theatres. His original surname, Mura, meant ‘Great in Battle’ and would have appeared dangerously conspicuous to the American Occupation authorities. Hence, he began selling his work under the name Shigeru Mizuki (‘Waterwood’). In 1959, Mizuki revived the stories of Kitaro of the Graveyard as a comic. The first volumes received a very limited print-run, intended only for rental libraries as most Japanese could still not afford to buy anything beyond the most essential items. It began running in Shonen Magazine in 1965, where it proved remarkably unpopular, although it soon rose through the ranks after the story began twisting to follow the reader-survey cards. Horror was out; they wanted to see Kitaro fighting evil spirits. By 1966, the story had become softer and more humorous, and it would have attracted a TV animated remake, were it not for the title: sponsors didn’t want to back a show with “Graveyard” in the title. The switch to Gegege no Kitaro (‘Spooky Ooky Kitaro’) came in November 1967, a couple o fmonths ahead of the first anime broadcast, with a new name that didn’t frighten the advertisers away. With an episodic, picaresque story that rarely took long to pick up, it migrated from magazine to magazine throughout the 1970s, and has appeared in anime adaptations in every decade since. Even though Shigeru Mizuki is widely known as the ‘creator’ of Kitaro, he is better described as a collector of mythologies. He was, after all, only a child when Kitaro stories first began appearing in the 1930s; Kitaro was merely one of many yokai (spirits/ghosts/ghouls) in Japanese popular mythology, and the first of many hundreds of ghost stories from all over Japan that Mizuki would collate, refashion and retell over the years. Mizuki has become such an authority on Japanese ghosts and spirits that he has even written a book on the subject: An Illustrated Encyclopaedia of Japanese Spirits (Zuisetsu Nihon Yokai Taizen, 1994). His birthplace of Sakaiminato is now a giant museum to his works, and features a hundred statues of Kitaro and his ghostly associates dotted across the town. Mizuki was one of the first manga creators to deal with the rush of modernity, depicting Japanese ghosts largely as peaceful, gentle creatures forced into action by the encroachment of human civilisation on their remote, secluded places of haunting. In particular, he cited electric light as the main nemesis of spirits from the otherworld, giving his stories an elegiac quality that celebrates Japanese folktale traditions, even as he laments their passing. But with six TV series, half a dozen movies and several manga incarnations, the spirits of Spooky Kitaro never seem to stay dormant for long. The Kitaro franchise has captured the imaginations of several generations of Japanese, and become a ubiquitous part of Japanese media for the last half-century. The cartoon series on TV was an early directing job for future Studio Ghibli co-founder Isao Takahata, and previous live-action film adaptations of Shigeru Mizuki’s work include one by the legendarily prolific Takashi Miike. The original Kitaro theme song, a creepy singalong that combined the verve of The Addams Family with a chorus that celebrated the fact that ghosts didn’t have to go to school, remains a popular tune with Japanese of all ages. These two recent Kitaro movies unite a huge roster of big names from the Japanese entertainment business, including many cameo appearances for much-loved stars of the small screen, returns of the original voices of many of the characters from the cartoon series, and reinterpretations of well-known characters by the new stars of today. This entry was posted in News and tagged Ge ge ge no Kitaro, Kitaro, Manga Entertainment by ixarette. Bookmark the permalink.